For other uses, see World War III (disambiguation). "Third World War" redirects here. For the band, see Third World War (band). Nuclear warfare is a common theme of World War III scenarios. Such a conflict has been hypothesised to result in the extinction of mankind. World War III (WWIII or WW3) and the Third World War are names given to a hypothetical third worldwide large-scale military conflict subsequent to World War I and World War II. The term has been in use since at least as early as 1941. Some have applied it loosely to refer to limited or smaller conflicts such as the Cold War or the War on Terror, while others assumed that such a conflict would surpass prior world wars both in its scope and its destructive impact. Because of the development and use of nuclear weapons near the end of World War II and their subsequent acquisition and deployment by many countries, the potential risk of a nuclear devastation of Earth's civilization and life is a common theme in speculations about a Third World War. Another major concern is that biological warfare could cause a very large number of casualties, either intentionally or inadvertently by an accidental release of a biological agent, the unexpected mutation of an agent, or its adaptation to other species after use. High-scale apocalyptic events like these, caused by advanced technology used for destruction, could potentially make the Earth's surface uninhabitable. Military planners have been war gaming various scenarios, preparing for the worst, since the early days of the Cold War. Some of those plans are now out of date and have been partially or fully declassified. British Prime Minister Winston Churchill was concerned that, with the enormous size of Soviet forces deployed in Europe at the end of WWII and the unreliability of the Soviet leader Joseph Stalin, there was a serious threat to Western Europe. In April–May 1945, British Armed Forces developed Operation Unthinkable, thought to be the first scenario of the Third World War. Its primary goal was "to impose upon Russia the will of the United States and the British Empire". The plan was rejected by the British Chiefs of Staff Committee as militarily unfeasible. "Operation Dropshot" was the 1950s United States contingency plan for a possible nuclear and conventional war with the Soviet Union in the Western European and Asian theaters. At the time the US nuclear arsenal was limited in size, based mostly in the United States, and depended on bombers for delivery. "Dropshot" included mission profiles that would have used 300 nuclear bombs and 29,000 high-explosive bombs on 200 targets in 100 cities and towns to wipe out 85% of the Soviet Union's industrial potential at a single stroke. Between 75 and 100 of the 300 nuclear weapons were targeted to destroy Soviet combat aircraft on the ground. The scenario was devised prior to the development of intercontinental ballistic missiles. It was also devised before U.S. President John F. Kennedy and his Secretary of Defense Robert McNamara changed the US Nuclear War plan from the 'city killing' countervalue strike plan to a "counterforce" plan (targeted more at military forces). Nuclear weapons at this time were not accurate enough to hit a naval base without destroying the city adjacent to it, so the aim in using them was to destroy the enemy industrial capacity in an effort to cripple their war economy. In January 1950, the North Atlantic Council approved NATO's military strategy of containment. NATO military planning took on a renewed urgency following the outbreak of the Korean War in the early 1950s, prompting NATO to establish a "force under a centralised command, adequate to deter aggression and to ensure the defence of Western Europe". Allied Command Europe was established under General of the Army Dwight D. Eisenhower, US Army, on 2 April 1951. The Western Union Defence Organization had previously carried out Exercise Verity, a 1949 multilateral exercise involving naval air strikes and submarine attacks. Exercise Mainbrace brought together 200 ships and over 50,000 personnel to practice the defence of Denmark and Norway from Russian attack in 1952. It was the first major NATO exercise. The exercise was jointly commanded by Supreme Allied Commander Atlantic Admiral Lynde D. McCormick, USN, and Supreme Allied Commander Europe General Matthew B. Ridgeway, US Army, during the autumn of 1952. The US, UK, Canada, France, Denmark, Norway, Portugal, Netherlands, and Belgium all participated. Exercises Grand Slam and Longstep were naval exercises held in the Mediterranean Sea during 1952 to practice dislodging an enemy occupying force and amphibious assault. It involved over 170 warships and 700 aircraft under the overall command of Admiral Carney. The overall exercise commander, Admiral Carney summarized the accomplishments of Exercise Grand Slam by stating: "We have demonstrated that the senior commanders of all four powers can successfully take charge of a mixed task force and handle it effectively as a working unit." The USSR called the exercises "war-like acts" by NATO, with particular reference to the participation of Norway and Denmark, and prepared for its own military maneuvers in the Soviet Zone. This was a major NATO naval exercise held in 1957, simulating a response to an all-out Soviet attack on NATO. The exercise involved over 200 warships, 650 aircraft, and 75,000 personnel from the United States Navy, the United Kingdom's Royal Navy, the Royal Canadian Navy, the French Navy, the Royal Netherlands Navy, and the Royal Norwegian Navy. As the largest peacetime naval operation up to that time, Operation Strikeback was characterized by military analyst Hanson W. Baldwin of The New York Times as "constituting the strongest striking fleet assembled since World War II". If activated, Operation Reforger would have largely consisted of convoys like this one from Operation Earnest Will in 1987, although much larger. While troops could easily fly across the Atlantic, the heavy equipment and armor reinforcements would have to come by sea. Exercise Reforger (from return of forces to Germany) was an annual exercise conducted, during the Cold War, by NATO. The exercise was intended to ensure that NATO had the ability to quickly deploy forces to West Germany in the event of a conflict with the Warsaw Pact. The Warsaw Pact outnumbered NATO throughout the Cold War in conventional forces, especially armor. Therefore, in the event of a Soviet invasion, in order not to resort to tactical nuclear strikes, NATO forces holding the line against a Warsaw Pact armored spearhead would have to be quickly resupplied and replaced. Most of this support would have come across the Atlantic from the US and Canada. Reforger was not merely a show of force—in the event of a conflict, it would be the actual plan to strengthen the NATO presence in Europe. In that instance, it would have been referred to as Operation Reforger. Important components in Reforger included the Military Airlift Command, the Military Sealift Command, and the Civil Reserve Air Fleet. A Warsaw Pact invasion would have come via three main paths through West Germany. Seven Days to the River Rhine was a top-secret military simulation exercise developed in 1979 by the Warsaw Pact. It started with the assumption that NATO would launch a nuclear attack on the Vistula river valley in a first-strike scenario, which would result in as many as two million Polish civilian casualties. In response, a Soviet counter-strike would be carried out against West Germany, Belgium, the Netherlands and Denmark, with Warsaw Pact forces invading West Germany and aiming to stop at the River Rhine by the seventh day. Other USSR plans stopped only upon reaching the French border on day nine. Individual Warsaw Pact states were only assigned their own subpart of the strategic picture; in this case, the Polish forces were only expected to go as far as Germany. 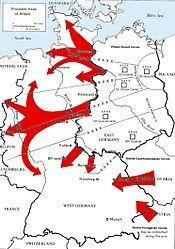 The Seven Days to the Rhine plan envisioned that Poland and Germany would be largely destroyed by nuclear exchanges, and that large numbers of troops would die of radiation sickness. It was estimated that NATO would fire nuclear weapons behind the advancing Soviet lines to cut off their supply lines and thus blunt their advance. While this plan assumed that NATO would use nuclear weapons to push back any Warsaw Pact invasion, it did not include nuclear strikes on France or the United Kingdom. Newspapers speculated when this plan was declassified, that France and the UK were not to be hit in an effort to get them to withhold use of their own nuclear weapons. 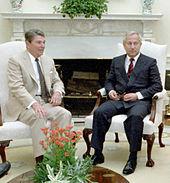 President Ronald Reagan and Soviet double agent Oleg Gordievsky, who later told the west how close the Able Archer 83 exercise had brought the Soviets to ordering a First Strike. Exercise Able Archer was an annual exercise by the United States military in Europe that practised command and control procedures, with emphasis on the transition from solely conventional operations to chemical, nuclear, and conventional operations during a time of war. "Able Archer 83" was a five-day North Atlantic Treaty Organization (NATO) command post exercise starting on 7 November 1983, that spanned Western Europe, centered on the Supreme Headquarters Allied Powers Europe (SHAPE) Headquarters in Casteau, north of the city of Mons. Able Archer exercises simulated a period of conflict escalation, culminating in a coordinated nuclear attack. The realistic nature of the 1983 exercise, coupled with deteriorating relations between the United States and the Soviet Union and the anticipated arrival of strategic Pershing II nuclear missiles in Europe, led some members of the Soviet Politburo and military to believe that Able Archer 83 was a ruse of war, obscuring preparations for a genuine nuclear first strike. In response, the Soviets readied their nuclear forces and placed air units in East Germany and Poland on alert. This "1983 war scare" is considered by many historians to be the closest the world has come to nuclear war since the Cuban Missile Crisis of 1962. The threat of nuclear war ended with the conclusion of the exercise on 11 November, however. The Strategic Defense Initiative (SDI) was proposed by U.S. President Ronald Reagan on 23 March 1983. In the latter part of his presidency, numerous factors (which included watching the 1983 movie The Day After and hearing through a Soviet defector that Able Archer 83 almost triggered a Russian first strike) had turned Ronald Reagan against the concept of winnable nuclear war, and he began to see nuclear weapons as more of a "wild card" than a strategic deterrent. Although he later believed in disarmament treaties slowly blunting the danger of nuclear weaponry by reducing their number and alert status, he also believed a technological solution might allow incoming ICBMs to be shot down, thus making the US invulnerable to a first strike. However, the USSR saw the SDI concept as a major threat, since a unilateral deployment of the system would allow the US to launch a massive first strike on the Soviet Union without any fear of retaliation. The SDI concept was to use ground-based and space-based systems to protect the United States from attack by strategic nuclear ballistic missiles. The initiative focused on strategic defense rather than the prior strategic offense doctrine of Mutual Assured Destruction (MAD). The Strategic Defense Initiative Organization (SDIO) was set up in 1984 within the United States Department of Defense to oversee the Strategic Defense Initiative. NATO operational plans for a Third World War have involved NATO allies who do not have their own nuclear weapons, using nuclear weapons supplied by the United States as part of a general NATO war plan, under the direction of NATO's Supreme Allied Commander. Of the three nuclear powers in NATO (France, the United Kingdom and the United States), only the United States has provided weapons for nuclear sharing. As of November 2009[update], Belgium, Germany, Italy, the Netherlands and Turkey are still hosting US nuclear weapons as part of NATO's nuclear sharing policy. Canada hosted weapons until 1984, and Greece until 2001. The United Kingdom also received US tactical nuclear weapons such as nuclear artillery and Lance missiles until 1992, despite the UK being a nuclear weapons state in its own right; these were mainly deployed in Germany. In peacetime, the nuclear weapons stored in non-nuclear countries are guarded by US airmen though previously some artillery and missile systems were guarded by US Army soldiers; the codes required for detonating them are under American control. In case of war, the weapons are to be mounted on the participating countries' warplanes. The weapons are under custody and control of USAF Munitions Support Squadrons co-located on NATO main operating bases who work together with the host nation forces. As of 2005[update], 180 tactical B61 nuclear bombs of the 480 US nuclear weapons believed to be deployed in Europe fall under the nuclear sharing arrangement. The weapons are stored within a vault in hardened aircraft shelters, using the USAF WS3 Weapon Storage and Security System. The delivery warplanes used are F-16s and Panavia Tornados. With the initiation of the Cold War arms race in the 1950s, an apocalyptic war between the United States and the Soviet Union became a real possibility. During the Cold War era (1947–1991), a number of military events have been described as having come quite close to potentially triggering World War III. The Korean War was a war between two coalitions fighting for control over the Korean Peninsula: a communist coalition including North Korea, China and the USSR, and a capitalist coalition including South Korea, the United States, and the UN. Many then believed that the conflict was likely to soon escalate into a full-scale war between the three countries, the US, the USSR, and China. CBS war correspondent Bill Downs wrote in 1951 that, "To my mind, the answer is: Yes, Korea is the beginning of World War III. The brilliant landings at Inchon and the cooperative efforts of the American armed forces with the United Nations Allies have won us a victory in Korea. But this is only the first battle in a major international struggle which now is engulfing the Far East and the entire world." Downs afterwards repeated this belief on ABC Evening News while reporting on the USS Pueblo incident in 1968. A US Navy HSS-1 Seabat helicopter hovers over Soviet submarine B-59, forced to the surface by US Naval forces in the Caribbean near Cuba. B-59 had a nuclear torpedo on board, and three officer keys were required to use it. Only one dissent prevented the submarine from attacking the US fleet nearby, a spark that could have led to a Third World War (October 28–29, 1962). The Cuban Missile Crisis: a confrontation on the stationing of Soviet nuclear missiles in Cuba, in response to the failed Bay of Pigs Invasion, is considered as having been the closest to a nuclear exchange, which could have precipitated a Third World War. The crisis peaked on 27 October, with three separate major incidents occurring on the same day, all of these incidents having been initiated by the US military. 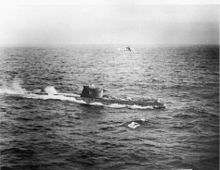 The "Arkhipov save" incident occurred when a Soviet submarine nearly launched a nuclear-tipped torpedo in response to having been targeted by American naval depth charges in international waters, with the Soviet nuclear launch response only having being prevented by Soviet naval officer Vasily Arkhipov. The shooting down of a U-2 while violating Cuban airspace. The near interception of another U-2 that had somehow managed to stray into Soviet airspace over Siberia, which airspace violation nearly caused the Soviets to believe that this might be the vanguard of a US aerial bombardment. Despite what many believe to be the closest the world has come to a nuclear conflict, throughout the entire standoff, the Doomsday Clock, which is run by the Bulletin of the Atomic Scientists to estimate how close the end of the world, or doomsday, is, with midnight being the apocalypse, stayed at a relatively stable seven minutes to midnight. This has been explained as being due to the brevity of the crisis, since the clock monitored more long term factors such as leadership of countries, conflicts, wars, and political upheavals, as well as societies reactions to said factors. A Washington to Moscow direct telephone line, resulted from the communication trouble between the White House and the Kremlin during the crisis, giving the leaders of the two largest nuclear powers the ability to contact each other in real time, rather than sending written messages that needed to be translated and wired, which had dragged out conversations in which seconds could have potentially prevented a nuclear exchange. The second factor was caused in part due to the worldwide reaction to how close the US and USSR had come to the brink of World War III during the standoff. As the public began to more closely monitor topics involving nuclear weapons, and therefore to rally support for the cause of non-proliferation, the 1963 test ban treaty was signed. To date this treaty has been signed by 126 total nations, with the most notable exceptions being France and China. Both of these countries were still in the relative beginning stages of their nuclear programs at the time of the original treaty signing, and both sought nuclear capabilities independent of their allies. The Yom Kippur War, also known as the Ramadan War, or October War, began with Arab victories. Israel successfully counterattacked. Tensions grew between the US (which supported Israel) and the Soviet Union (which sided with the Arab states). American and Soviet naval forces came close to firing upon each other. Admiral Murphy of the US reckoned the chances of the Soviet squadron attempting a first strike against his fleet at 40 percent. The Pentagon moved Defcon status from 4 to 3. The superpowers had been pushed to the brink of war, but tensions eased with the ceasefire brought in under UNSC 339. The United States made emergency retaliation preparations after NORAD saw on-screen indications that a full-scale Soviet attack had been launched. No attempt was made to use the "red telephone" hotline to clarify the situation with the USSR and it was not until early-warning radar systems confirmed no such launch had taken place that NORAD realized that a computer system test had caused the display errors. A senator inside the NORAD facility at the time described an atmosphere of absolute panic. A GAO investigation led to the construction of an off-site test facility to prevent similar mistakes. A false alarm occurred on the Soviet nuclear early warning system, showing the launch of American Minuteman ICBMs from bases in the United States. A retaliatory attack was prevented by Stanislav Petrov, an officer of the Soviet Air Defence Forces, who realised the system had simply malfunctioned (which was borne out by later investigations). During Able Archer 83, a ten-day NATO exercise simulating a period of conflict escalation that culminated in a DEFCON 1 nuclear strike, some members of the Soviet Politburo and armed forces treated the events as a ruse of war concealing a genuine first strike. In response, the military prepared for a coordinated counter-attack by readying nuclear forces and placing air units stationed in the Warsaw Pact states of East Germany and Poland under high alert. However, the state of Soviet preparation for retaliation ceased upon completion of the Able Archer exercises. The Norwegian rocket incident is the only World War III close call to occur outside the Cold War. This incident occurred when Russia's Olenegorsk early warning station accidentally mistook the radar signature from a Black Brant XII research rocket (being jointly launched by Norwegian and US scientists from Andøya Rocket Range), as appearing to be the radar signature of the launch of a Trident SLBM missile. In response, Russian President Boris Yeltsin was summoned and the Cheget nuclear briefcase was activated for the first and only time. However, the high command was soon able to determine that the rocket was not entering Russian airspace, and promptly aborted plans for combat readiness and retaliation. It was retrospectively determined that, while the rocket scientists had informed thirty states including Russia about the test launch, the information had not reached Russian radar technicians. In 2004, neoconservative commentator Norman Podhoretz proposed that the Cold War might rightly be called World War III. In 2006 on CNBC's Kudlow and Company, host Lawrence Kudlow, discussing a book by former deputy Under-Secretary of Defense Jed Babbin, agreed with Podhoretz, adding, "World War IV is the terror war, and war with China would be World War V."
Still the majority of historians would seem to hold that World War III would necessarily have to be a worldwide "war in which large forces from many countries fought" and a war that "involves most of the principal nations of the world." In his book Secret Weapons of the Cold War, Bill Yenne explains that the military standoff that occurred between the two 'Superpowers', namely the United States and the Soviet Union, from the 1940s through to 1991, was only the Cold War, which ultimately helped to enable mankind to avert the possibility of an all out nuclear confrontation, and that it certainly was not World War III itself. The "War on Terror" that began with the September 11 attacks has been claimed by some to be World War III or sometimes as World War IV. Others have disparaged such claims as "distorting American history." While there is general agreement amongst historians regarding the definitions and extent of the first two world wars, namely due to the unmistakable global scale of aggression and self-destruction of these two wars, a few have claimed that a "World War" might now no longer require such worldwide and large scale aggression and carnage. Still, such claims of a new "lower threshold of aggression," that might now be sufficient to qualify a war as a "World War" have not gained such widespread acceptance and support as the definitions of the first two world wars have received amongst historians. On 1 February 2015, Iraqi Foreign Minister Ibrahim al-Jaafari declared that the War on ISIL was effectively "World War III", due to ISIL's declaration of a Worldwide Caliphate, its aims to conquer the world, and its success in spreading the conflict to multiple countries outside of the Levant region. In response to the November 2015 Paris attacks, King of Jordan Abdullah II said "We are facing a Third World War [within Islam]." In his State of the Union Address on 12 January 2016, U.S. President Barack Obama warned that news reports granting ISIL the supposed ability to foment WW III might be excessive and irresponsible, stating that, "as we focus on destroying ISIL, over-the-top claims that this is World War III just play into their hands. Masses of fighters on the back of pickup trucks and twisted souls plotting in apartments or garages pose an enormous danger to civilians and must be stopped. But they do not threaten our national existence." Multiple small wars as a "third war"
In multiple recorded interviews under somewhat casual circumstances, comparing the conflagrations of World War I and II to the ongoing lower intensity wars of the 21st century, Pope Francis has said, "The world is at war, because it has lost peace," and "perhaps one can speak of a third war, one fought piecemeal." In 1949, after the unleashing of nuclear weaponry at the end of WWII, physicist Albert Einstein suggested that any outcome of a possible WWIII would be so dire as to revert mankind back to the Stone Age. When asked by journalist Alfred Werner, what types of weapons Einstein believed World War III might be fought with, Einstein warned, "I know not with what weapons World War III will be fought, but World War IV will be fought with sticks and stones". In his book Destined for War, Graham Allison views the global rivalry between the established power, the US, and the rising power, China, as an example of the Thucydides Trap. Past examples have often led to war, and in this case World War Three is possible but not inevitable. Wikimedia Commons has media related to World War III. Look up world war iii in Wiktionary, the free dictionary. ^ a b The New Quotable Einstein. By Alice Calaprice (2005), p. 173. ^ "Foreign News: World War III?". Time. 3 November 1941. Retrieved 12 August 2017. ^ "Foreign News: World War III?". Time. 22 March 1943. Retrieved 12 August 2017. ^ "International: Or Else?". Time. 15 February 1943. Retrieved 12 August 2017. ^ "Germany: For World War III". Time. 5 June 1944. Retrieved 12 August 2017. ^ "Science: World War III Preview?". Time. 10 July 1944. Retrieved 12 August 2017. ^ "Letters, Oct. 1, 1945". Time. 1 October 1945. Retrieved 12 August 2017. ^ "Policies & Principles: Morgenthau's Hope". Time. 15 October 1945. Retrieved 12 August 2017. ^ "Science: World War III Preview". Time. 25 March 1946. Retrieved 12 August 2017. ^ "Medicine: Germs for World War III?". Time. 29 December 1947. Retrieved 12 August 2017. ^ "The Nations: The Chances of World War III". Time. 15 March 1948. Retrieved 12 August 2017. ^ "Security: This Is What World War III Will Look Like". Time. 30 June 2015. Retrieved 12 August 2017. ^ (in English) Jonathan Walker (2013). Operation Unthinkable: The Third World War. The History Press. p. 192. ISBN 978-0-7524-8718-2. ^ Lord Ismay. "Chapter 3 – The Pace Quickens". NATO the first five years 1949–1954. NATO. Retrieved 19 September 2011. ^ "Chapter 4 – The Pace Quickens". NATO the first five years 1949–1954. NATO. Retrieved 19 September 2011. ^ "X" (July 1947). "The Sources of Soviet Conduct" . Foreign Affairs. 25 (4): 575–576. doi:10.2307/20030065. ISSN 0015-7120. JSTOR 20030065. ^ Baldwin, Hanson W. (22 September 1957). "100 Fighting Ships in Vast Exercise". New York Times. Retrieved 28 September 2009. ^ Nicholas Watt in Warsaw (26 November 2005). "Poland risks Russia's wrath with Soviet nuclear attack map | World news". The Guardian. Retrieved 4 March 2015. ^ a b c Benjamin B. Fischer (17 March 2007). "A Cold War Conundrum: The 1983 Soviet War Scare". Central Intelligence Agency. Archived from the original on 14 January 2009. Retrieved 13 January 2009. ^ Oberdorfer, A New Era, 66. ^ SNIE 11–10–84 "Implications of Recent Soviet Military-Political Activities" Central Intelligence Agency, 18 May 1984. ^ John Lewis Gaddis & John Hashimoto. "COLD WAR Chat: Professor John Lewis Gaddis, Historian". Archived from the original on 1 September 2005. Retrieved 29 December 2005. ^ Andrew and Gordievsky, Comrade Kryuchkov's Instructions, 87–8. ^ Pry, War Scare, 43–4. ^ Federation of American Scientists. Missile Defense Milestones Archived 6 March 2016 at the Wayback Machine. Accessed 10 March 2006. ^ a b c Malcolm Chalmers & Simon Lunn (March 2010), NATO's Tactical Nuclear Dilemma, Royal United Services Institute, retrieved 16 March 2010. ^ Hans M. Kristensen (5 October 2007). "U.S. Nuclear Weapons in Europe After the Cold War" (PDF). Federation of American Scientists. Retrieved 10 August 2013. ^ Downs, Bill (March 1951). "World War III in Asia?". See Magazine. ^ Downs, Bill (25 January 1968). "The USS Pueblo incident". ABC Evening News with Bob Young. ABC Evening News. Retrieved 8 November 2013. ^ "Remembering the Cuban Missile Crisis". thebulletin.org. 16 October 2012. ^ "The little-known US-Soviet confrontation during Yom Kippur War". ^ "Erol Araf: 'Incalculable consequences'". 7 October 2013. ^ "Inside the Kremlin During the Yom Kippur War By Victor Israelyan". ^ "CBC Digital Archives". CBC. ^ Andrews, Evan. "5 Cold War Close Calls". The History Channel. ^ Hoffman, David (10 February 1999). "I Had A Funny Feeling in My Gut". Washington Post. ^ Shane, Scott. "Cold War's Riskiest Moment". Baltimore Sun, 31 August 2003 (article reprinted as The Nuclear War That Almost Happened in 1983). Archived from the original on 19 August 2006. ^ "January 25, 1995—The Norwegian Rocket Incident". United States European Command. 23 January 2012. Archived from the original on 21 September 2012. ^ Hoffman, David (15 March 1998). "Cold-War Doctrines Refuse to Die". Washington Post Foreign Service. ^ Jackson, Mike (2007). Soldier. Transworld Publishers. pp. 255–275. ISBN 978-0-593-05907-4. ^ "Confrontation over Pristina airport". BBC News. 9 March 2000. Retrieved 27 October 2010. ^ Peck, Tom (15 November 2010). "How James Blunt saved us from World War 3". The Independent. London. Retrieved 2 March 2014. ^ Right-wing media divided: Is U.S. now in World War III, IV, or V? | Media Matters for America. Mediamatters.org (14 July 2006). Retrieved on 26 December 2011. ^ Definition of "World War": Cambridge Dictionary Cambridge University Press. Downloaded 21 April 2017. ^ Definition of "World War": Random House Random House/ Dictionary.com. 2017. Downloaded 21 April 2017. ^ Yenne, Bill. Secret Weapons of the Cold War. Berkly Book, New York. Published 2005. ^ OMelveny, Sean. "Are We Already Fighting World War III?". ^ Stromme, Lizzie (20 October 2016). "We're ALREADY at war: WW3 started on 9/11 with Twin Towers terror attack, ex-chief blasts". ^ "World War IV: How It Started, What It Means, and Why We Have to Win - Commentary Magazine". ^ Is this really World War IV? Los Angeles Times. By Peter Beinart. 9 Dec. 2007. Downloaded 21 April 2017. ^ "Jordan's King Abdullah: We are facing a Third World War". Jerusalem Post. 17 November 2015. Retrieved 17 February 2016. ^ Obama, Barak (13 January 2016). "2016 State of the Union Address". The White House. government of the United States of America. Retrieved 9 February 2016. ^ Pope says ‘world at war because it has lost peace’ but religion not to blame Japan Times. 28 July 2016. Downloaded 5 Feb.. 2017. ^ Pope Francis warns on 'piecemeal World War III BBC, 13 Sept. 2014. Downloaded 15 Jan. 2017. ^ Johnson, M. Alex (18 April 2005). "The culture of Einstein". msnbc.com. Retrieved 27 January 2018. Huntington, Samuel (1996). The Clash of Civilizations and the Remaking of World Order Simon & Schuster, New York. ISBN 978-0-684-84441-1. Langford, David (1981). War in 2080 : the future of military technology. London: Sphere Books. ISBN 978-0-7221-5393-2. Mearsheimer, John (2001). The Tragedy of Great Power Politics. W. W. Norton, New York. ISBN 978-0-393-34927-6. Pamidi, G.G. (2012). Possibility of a nuclear war in Asia : an Indian perspective. New Delhi: United Service Institution of India : Vij Books India. ISBN 978-93-81411-51-3. Piepers, Ingo (2016). 2020: WARning. Conijn Advies. ISBN 978-90-824118-1-2.